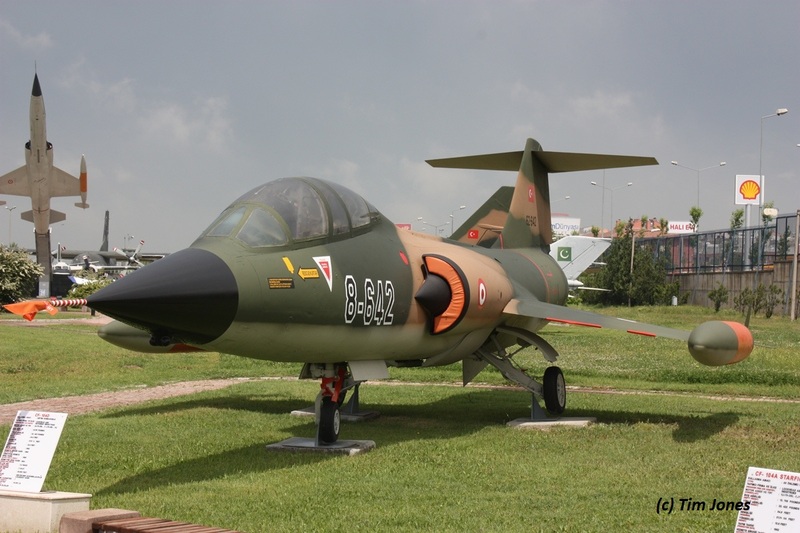 F-104G (c/n 4019) 61-2619 “FG619”, Turkish Air Force, preserved inside the Yesilkoy Aviation Museum, Istanbul, wearing the old 60s color scheme. 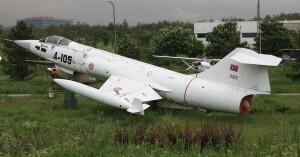 Tail section once belonged to c/n 8223. 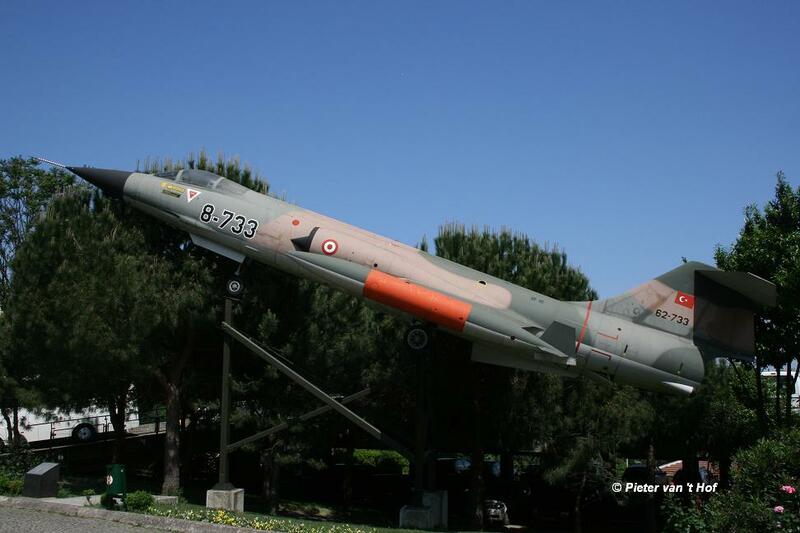 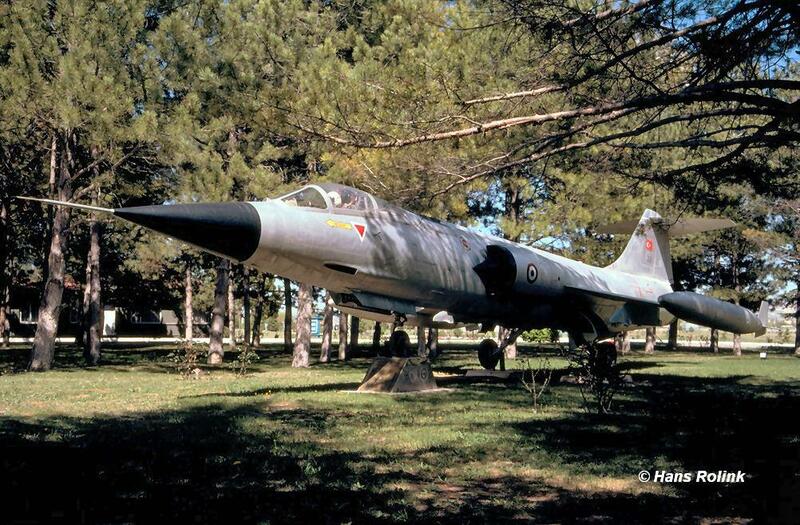 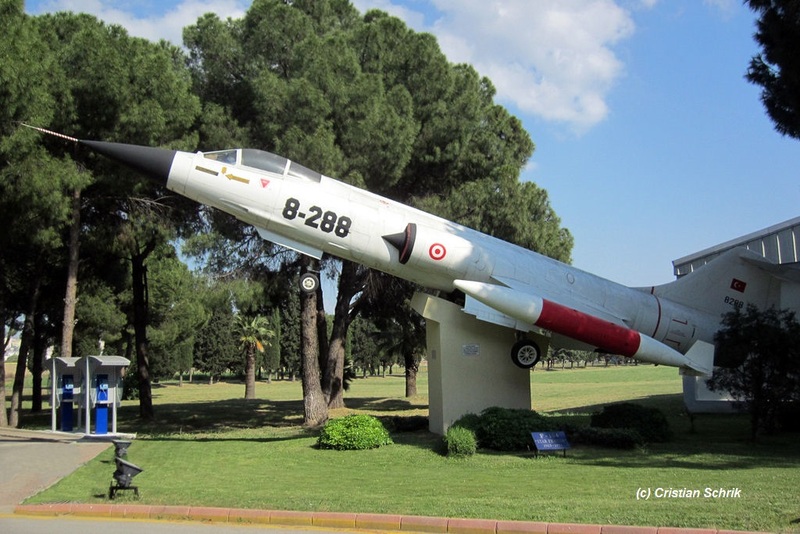 F-104G (c/n 4020) 61-2620 “E-620”, Turkish Air Force, preserved on a pole at the military area of Adnan – Menderes Apt. 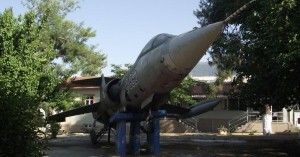 F-104G (c/n 4033) 61-2633 “FG633”, Turkish Air Force, preserved near the Technical School at Gaziemir. 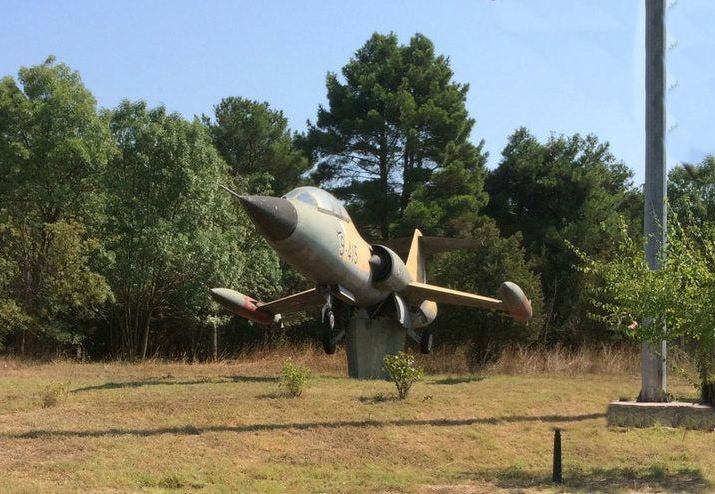 Currently found standing in the grass. F-104G (c/n 4041) 62-12239 “2239”, Turkish Air Force, preserved at the Isiklar Askeri Lisesi (Military High School) at Bursa aside F-104G 7161 “65-7161”..
F-104G (c/n 6015) 62-12316 “4-316” of 4 AJU, Turkish Air Force, preserved inside the Izelman park in Izmir-Incirali with tail from aircraft CF-104 “104733”. 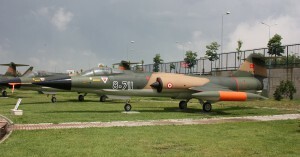 F-104G (c/n 6043) 62-12344 “4-344” of 4 AJU, Turkish Air Force, preserved inside the Yesilkoy Aviation Museum in Istanbul. 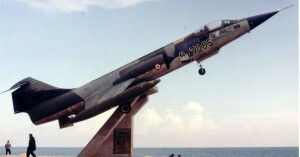 F-104G (c/n 6070) 63-12718, Turkish Air Force, preserved on a pole at a military camp near Antalya. 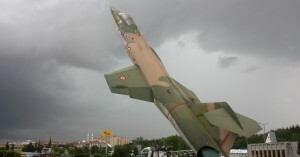 Since 2008 it is wearing a light grey F16 camouflage scheme. 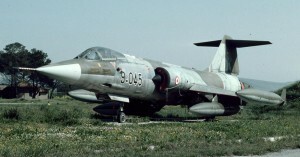 (ex “4-718”). 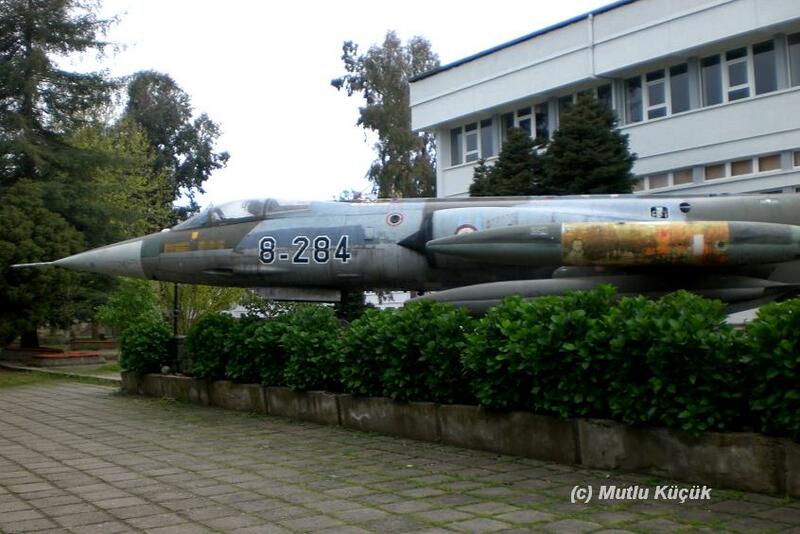 F-104G (c/n 6085) 63-12733 “4-733” of 4 AJU, Turkish Air Force, preserved near the university of Istanbul. 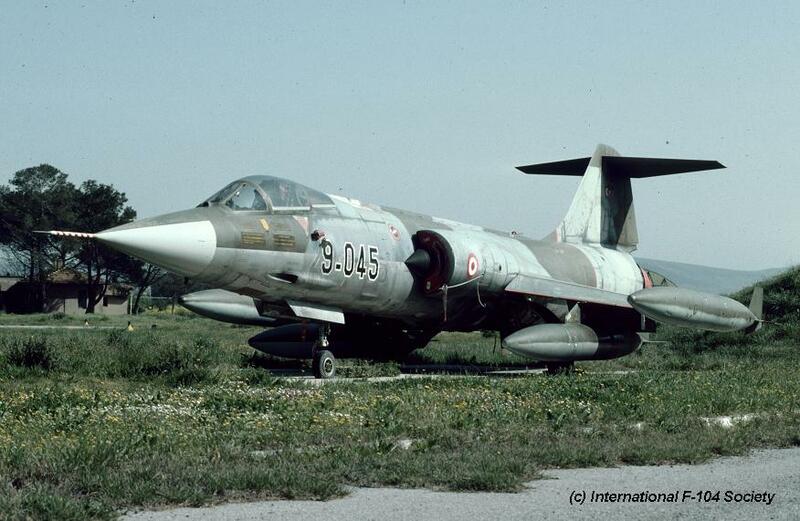 TF-104G (c/n 5529) 65-9415 “9-415” of 9AJU, Turkish Air Force, preserved as gateguard at Corlu AB. 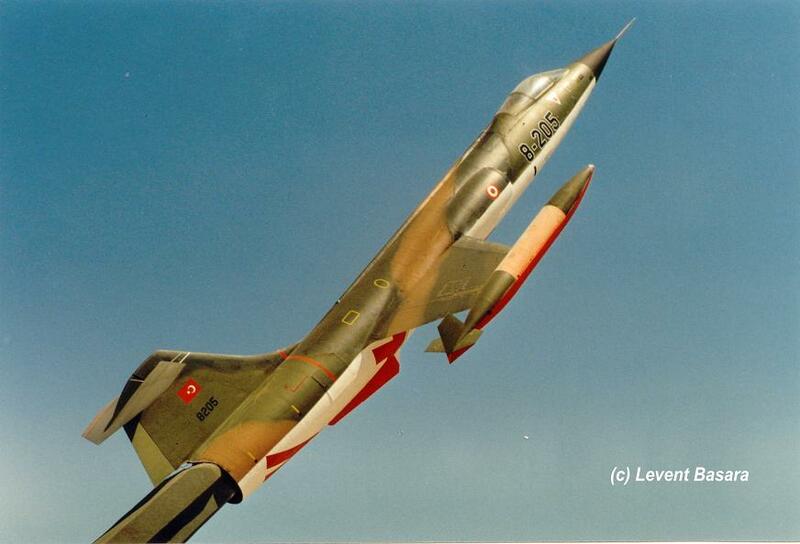 F-104G (c/n 2045) 2045 “9-045” of 9 AJU, Turkish Air Force, preserved at Balikesir wearing old Luftwaffe color scheme. 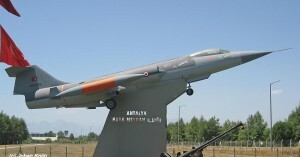 Possibly removed after mid 2010. 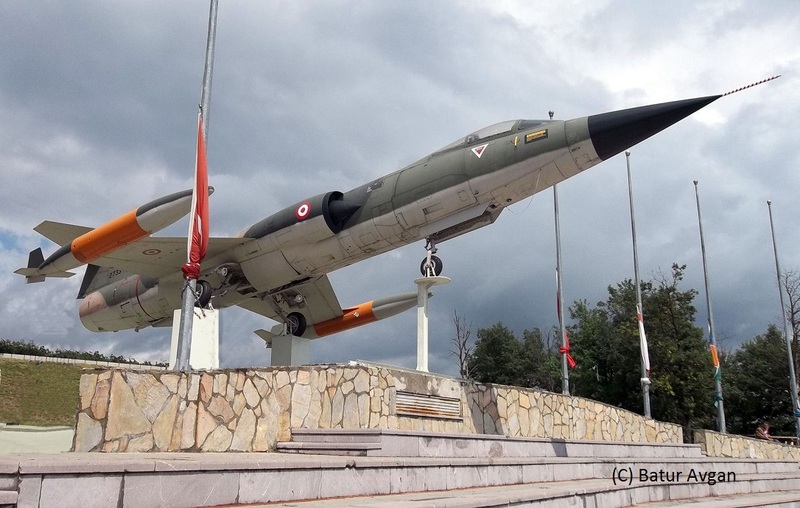 F-104G (c/n 2065) “8-065” of 8AJU, Turkish Air Force, preserved North East of Corlu Reserves Air Base since 1994. 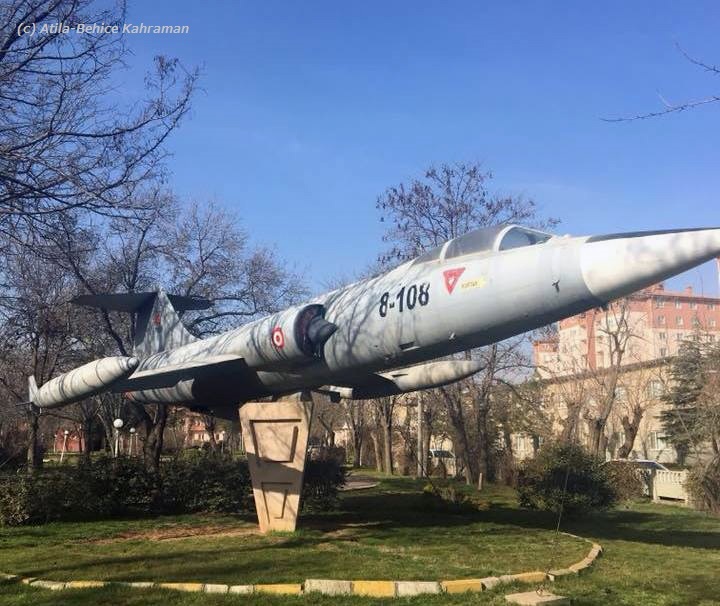 F-104G (c/n 2066) 2066 “8-066” of 8 AJU, Turkish Air Force, preserved at Diyarbakir near some buildings. 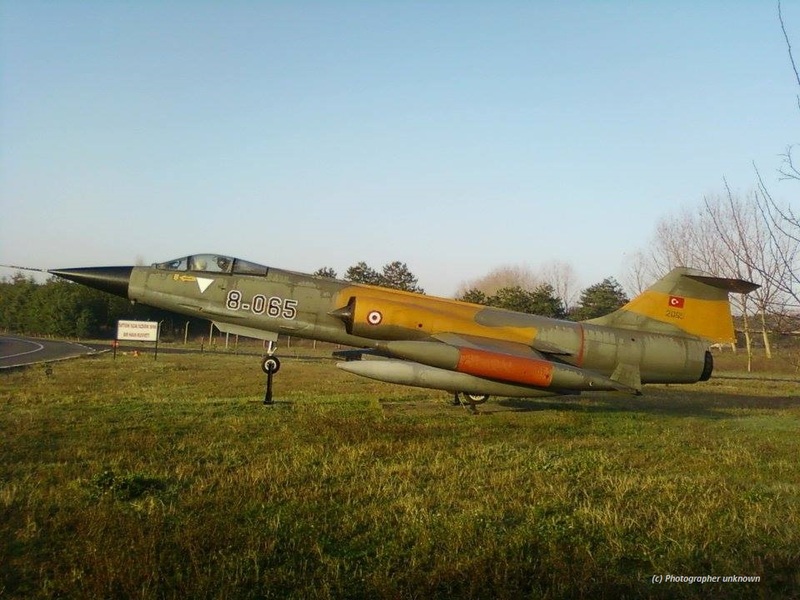 F-104G c/n 2081 is now (believed to be) preserved at the 191 Filo area at Balikesir with serial “9-191” and a Cobra painted on its tail. 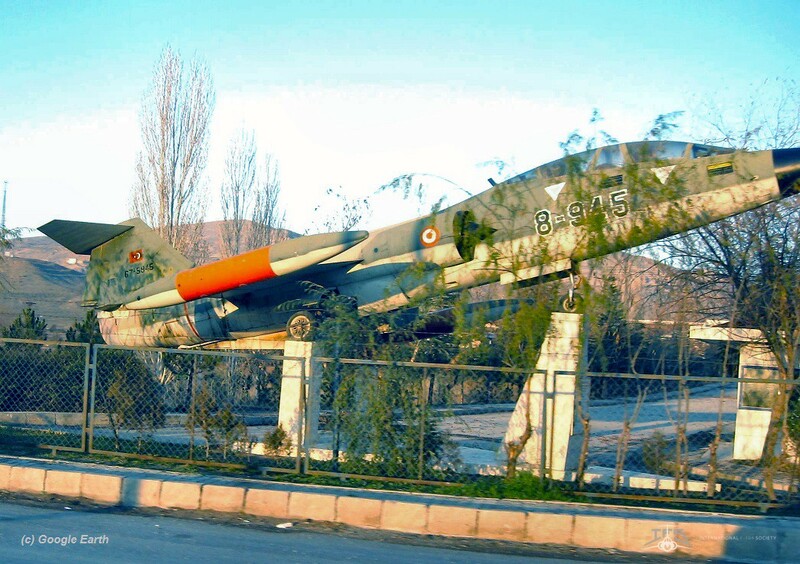 TF-104G (c/n 5703) 5703 “8-703” of 8 AJU, Turkish Air Force, preserved in the garden of the department of the university of Erciyer (Kayseri) along a road. 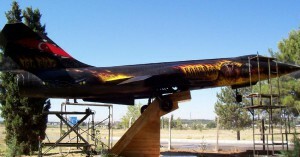 Since around 2013 the aircraft was refurbished and installed on a new applied platform. 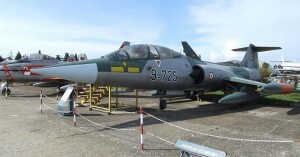 Photo shows the aircraft prior refurbishment. 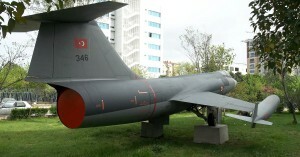 TF-104G (c/n 5711) 5711, Turkish Air Force, preserved in Yesilkoy – Istanbul, near the water, wearing an F-16 grey color scheme. 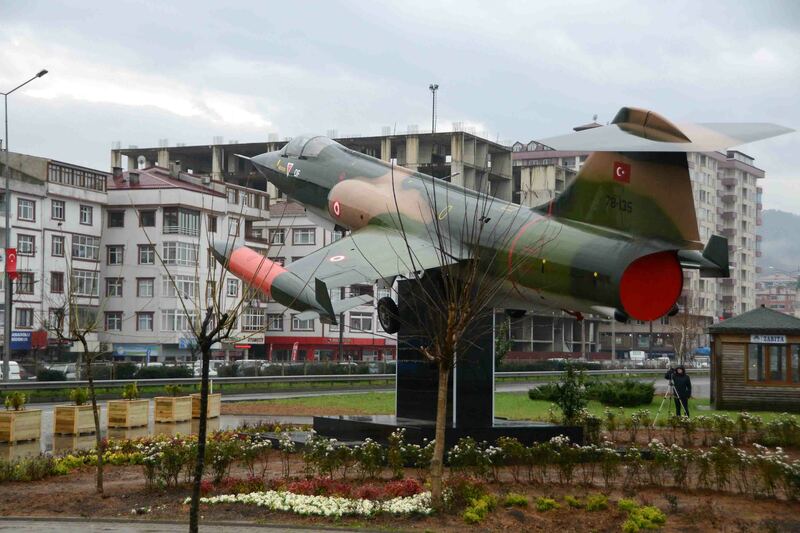 TF-104G (c/n 5721) 5721 “6-721” of 6 AJU, Turkish Air Force, preserved on a pole at Kütahya Apt antrance. 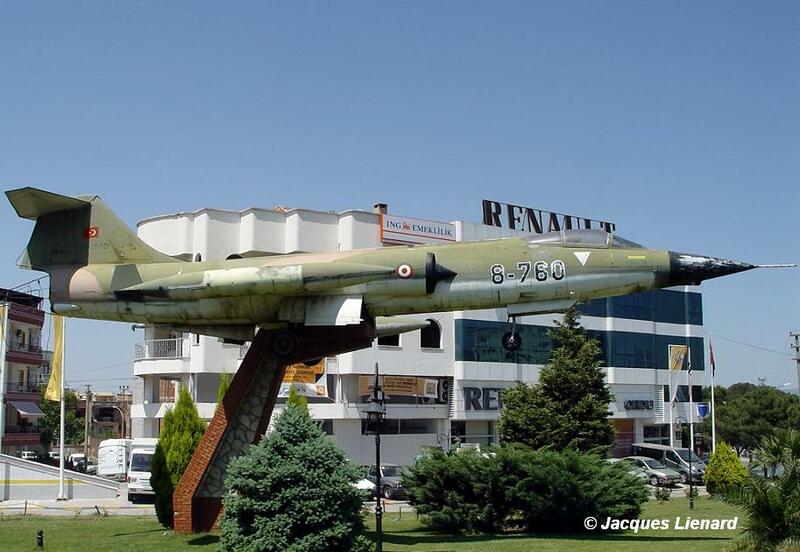 TF-104G (c/n 5722) 5722 “8-722” of 8 AJU, Turkish Air Force, preserved without markings and with F-16 camo scheme in Afyon on a pole as gateguard. 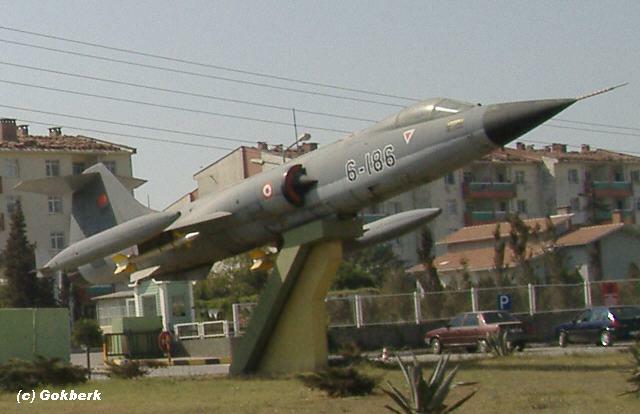 TF-104G (c/n 5911) 5911 “8-911” of 8 AJU, Turkish Air Force, preserved on a pole at the city of Çiğli. 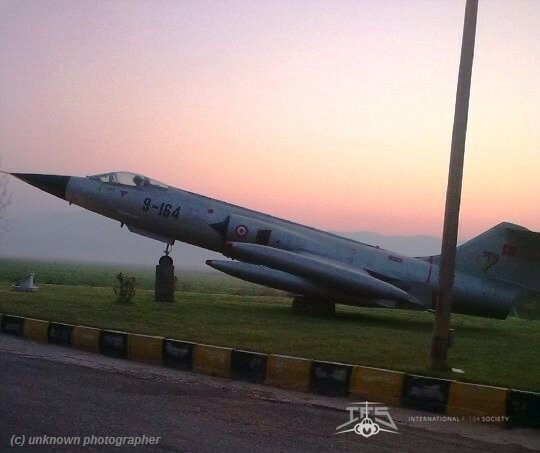 First noted in autumn 2013. 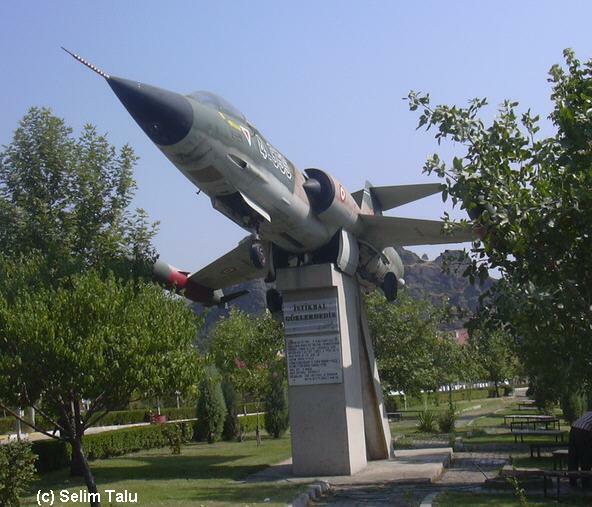 TF-104G (c/n 5945) 5945 “8-945” of 8 AJU, Turkish Air Force, formerly preserved at the University Campus in Kirikkale and now preserved on a pole in a small town named Keskin in Kirikkale province, Turkey re-named “”Keskin-1”. 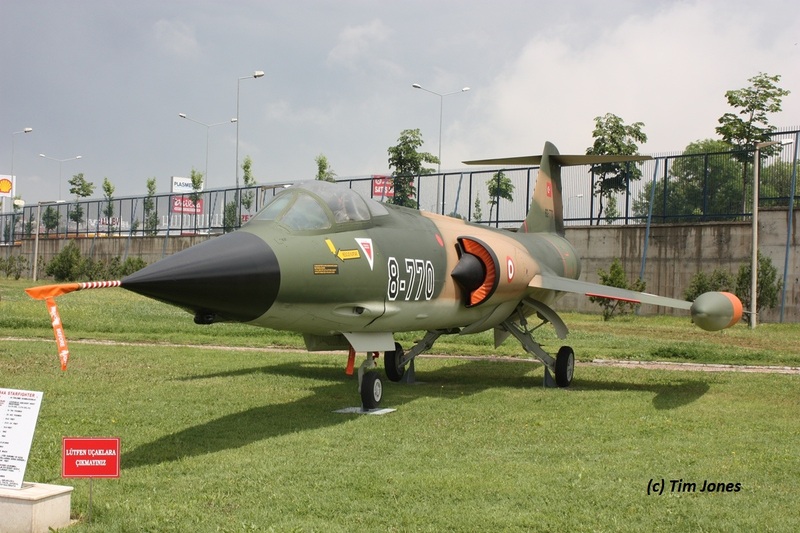 F-104G (c/n 6622) 6622 “9-622” of 9 AJU, Turkish Air Force, preserved inside the Base Museum at Balikesir wearing the experimental brown-lizard camouflage scheme. 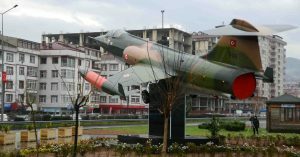 F-104S (c/n 1159) MM6859 “9-859” of 9AJU, Turkish Air Force, preserved with the Air Force Logistic Command in Etimesgut-Ankara. 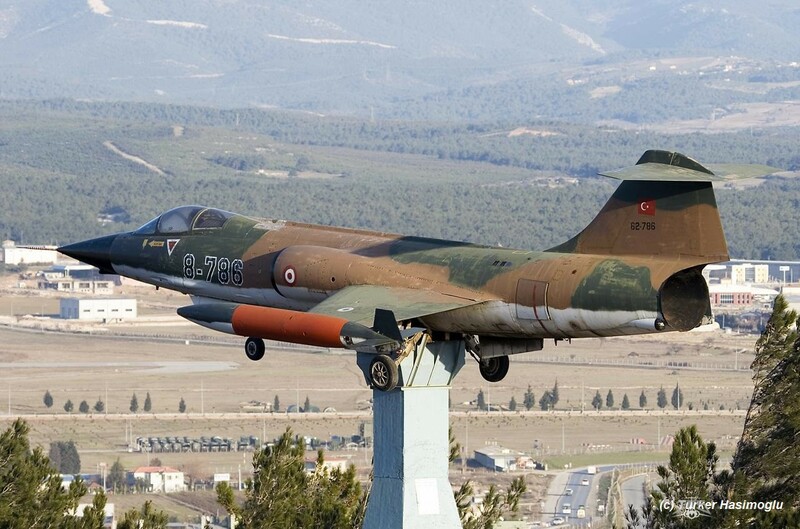 F-104S (c/n 1162) MM6862 “9-862” of 9AJU, Turkish Air Force, preserved at the campus of the Pamukkale University in Denizli, Turkey still wearing its old camouflage paint but missing its S ventral fins. 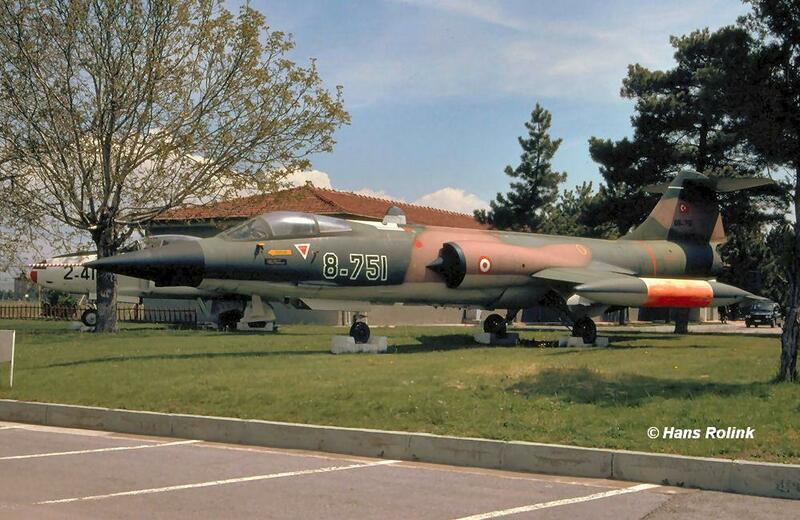 F-104S (c/n 1168) MM6868 “9-868” of 9AJU, Turkish Air Force, preserved inside the Yesilkoy IAP Museum in Yesilkoy-Istanbul. 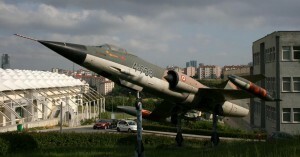 F-104S (c/n 1195) MM6895, Turkish Air Force, preserved without squadron markings and grey color scheme inside the Rahmi Kov Museum of Industry in Istanbul. 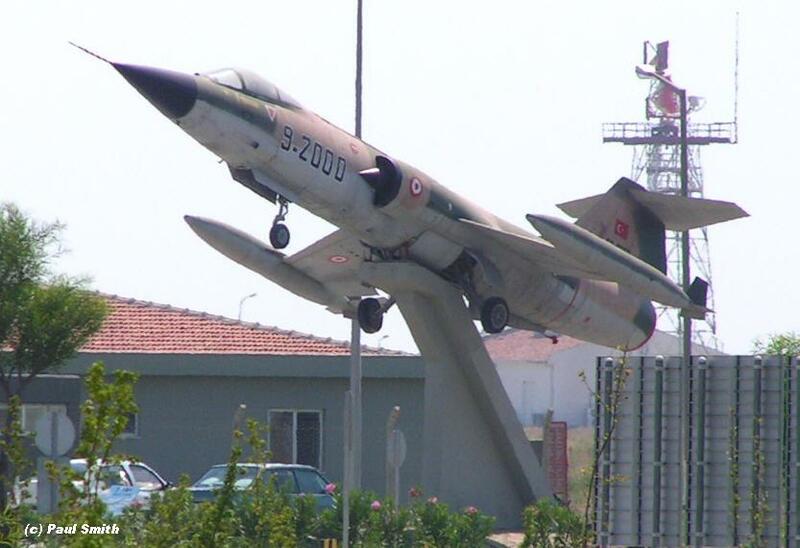 F-104G (c/n 7005) 7005 “8-7005” of 8AJU, Turkish Air Force, preserved on a pole in Mersin. 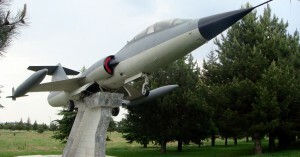 It has been taken down currently and will be installed back on a new structure after cleaning and maybe refurbishing. 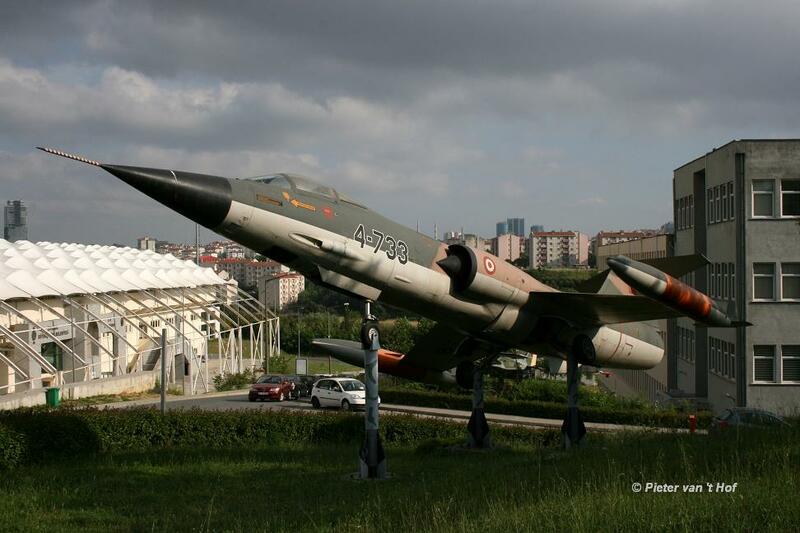 F-104G (c/n 7017) 7017 “5-017” of 5AJU, Turkish Air Force, preserved in at Merzifon AB. 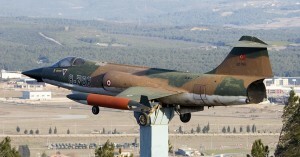 F-104G (c/n 7019) 7019 “4-019” of 4AJU, Turkish Air Force, preserved in German Luftwaffe camouflage scheme in a small village called Sila. 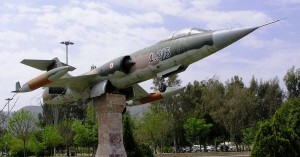 F-104G (c/n 7047) 7047 as “1937” and on its tail “7037”, Turkish Air Force, preserved at the Military academy (visible from ITU Ayazaga campus),Turkey. 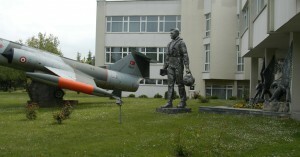 The number “1937” is linked to the fact that In 1937 the Air War College was established. 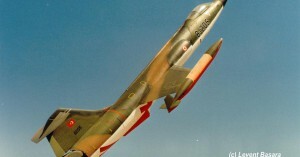 Sadly we have only a photo which shows half of the aircraft, Who has a better photo? 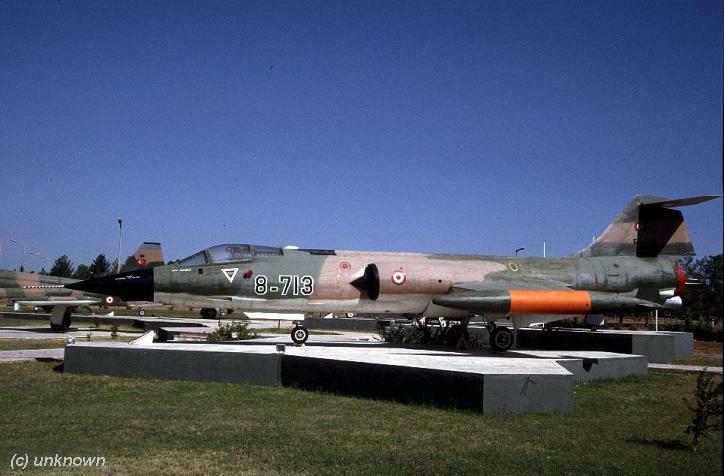 F-104G (c/n 7051) 7051 “4-051” of 4AJU, Turkish Air Force, preserved at Akinci AB (former known as Murted AB). 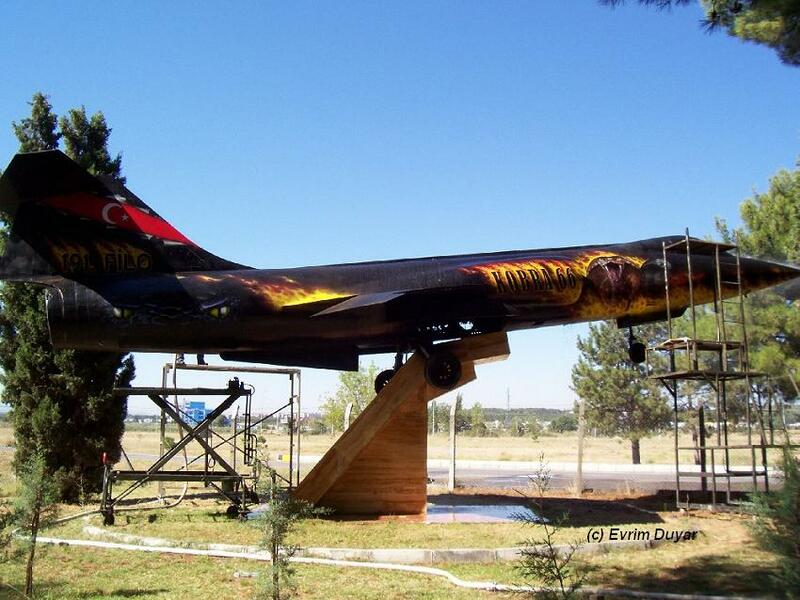 F-104G (c/n 7101) “10-101” , Turkish Air Force, preserved at Incirlik AB with the 10AJU, 101Filo (Tanker unit). 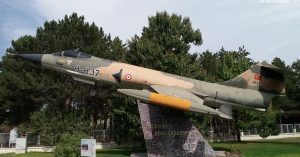 F-104G (c/n 7108) 7108 “8-108” of 8AJU, Turkish Air Force, preserved at Diyarbakir, East from the airbase in a park in grey colorsscheme. 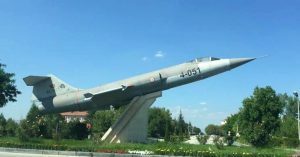 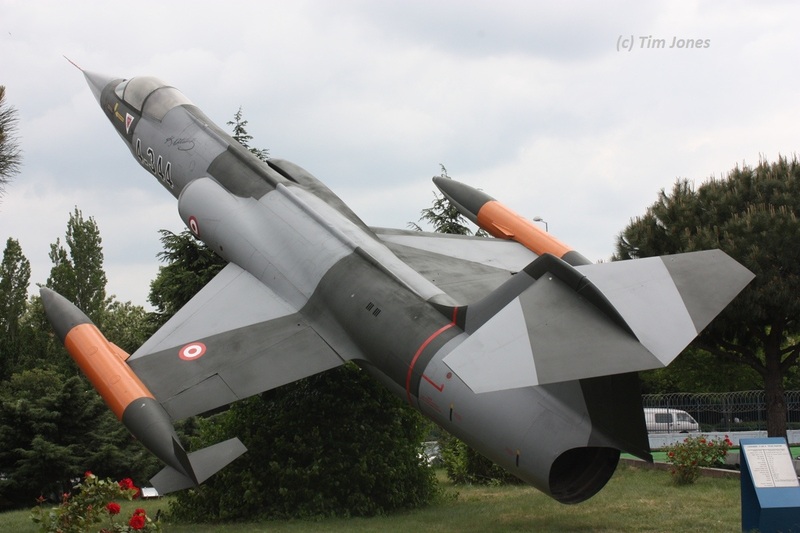 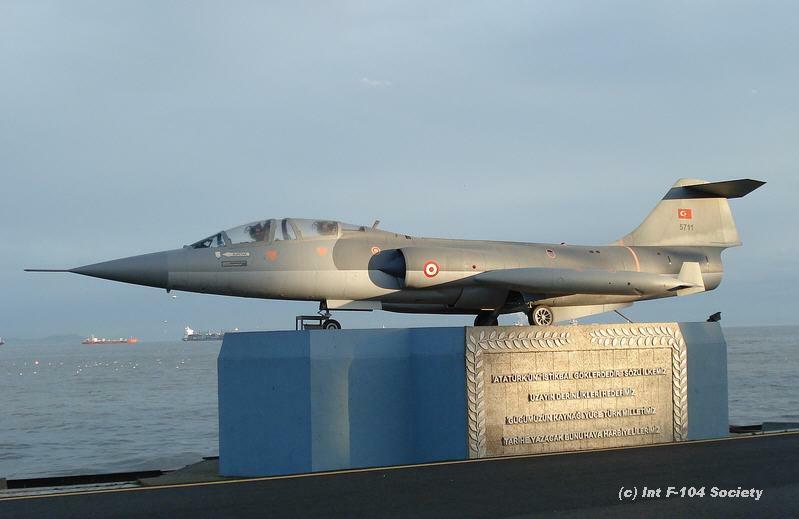 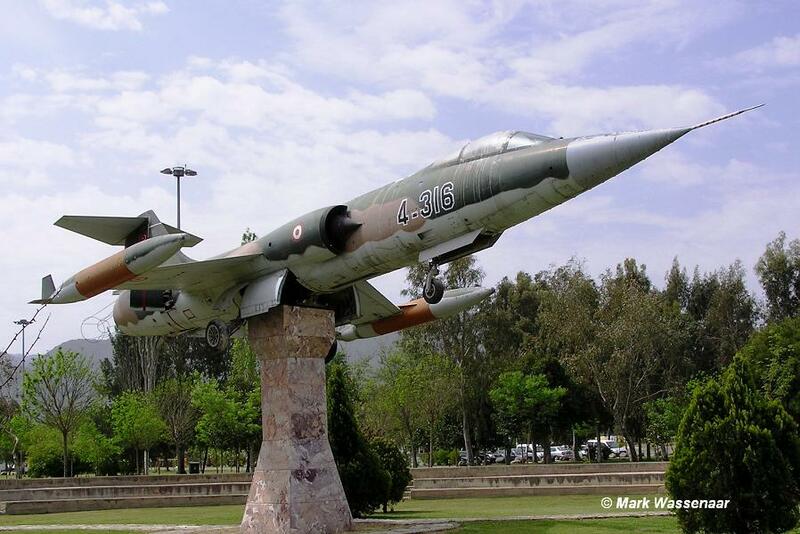 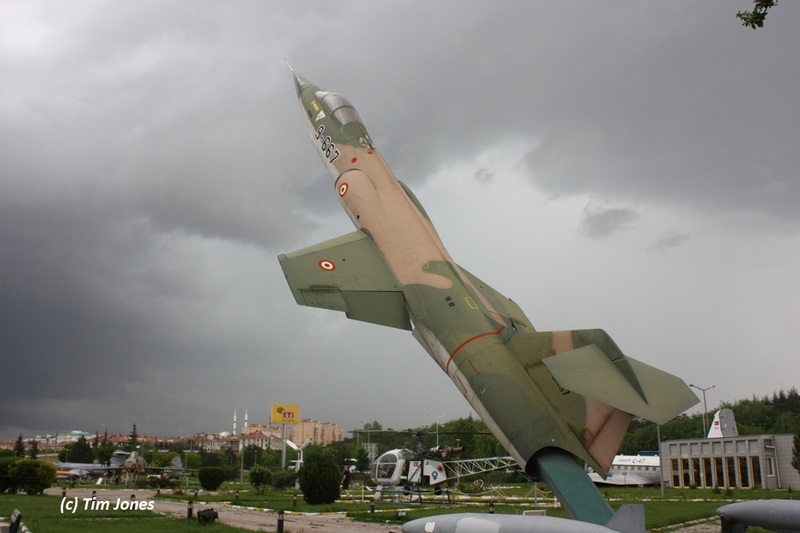 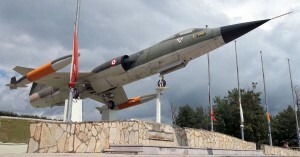 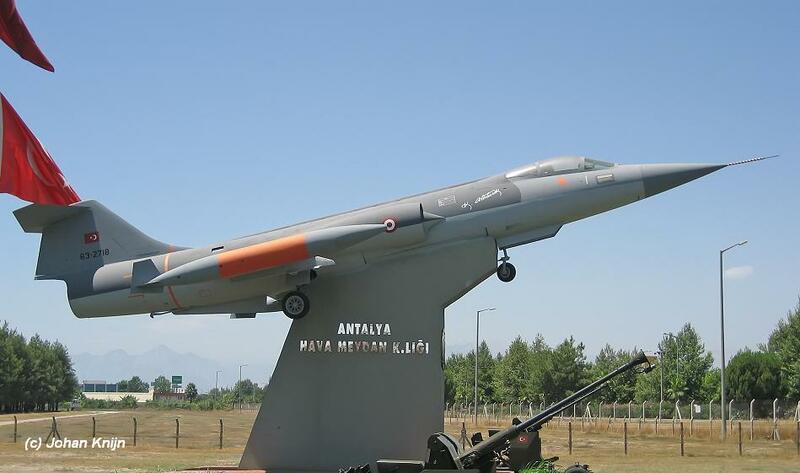 F-104G (c/n 7122) 7122 of 9AJU (coded 9-191 and 9-192), Turkish Air Force, preserved in front of the new Kamal Ata Turk monument in Balikesir City. 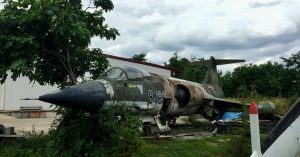 It arrived there around 2008. 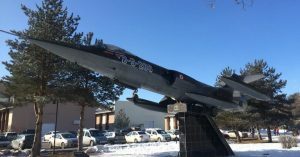 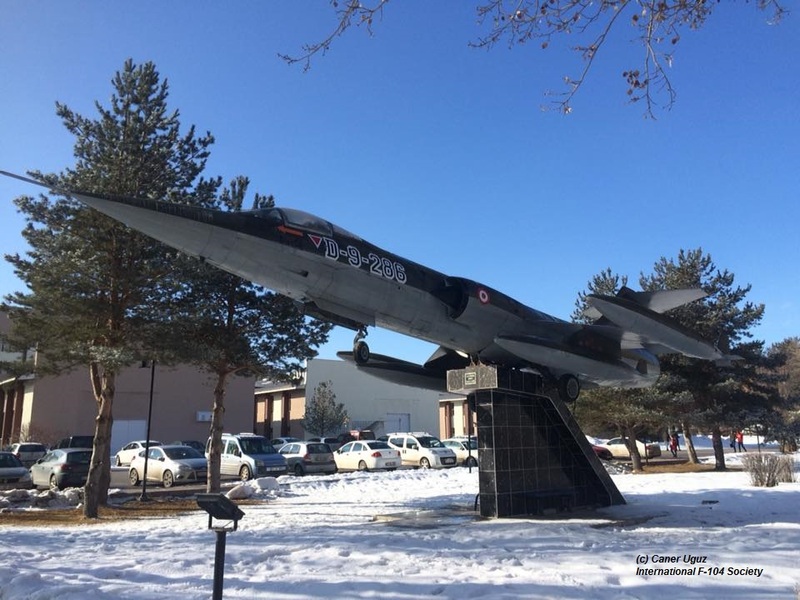 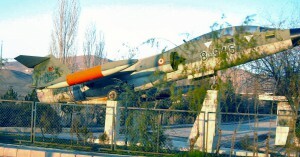 F-104G (c/n 7125) “9-125”, Turkish Air Force, preserved on a pole at the entrance of the Celal Bayar University at Manisa-Muradiye. 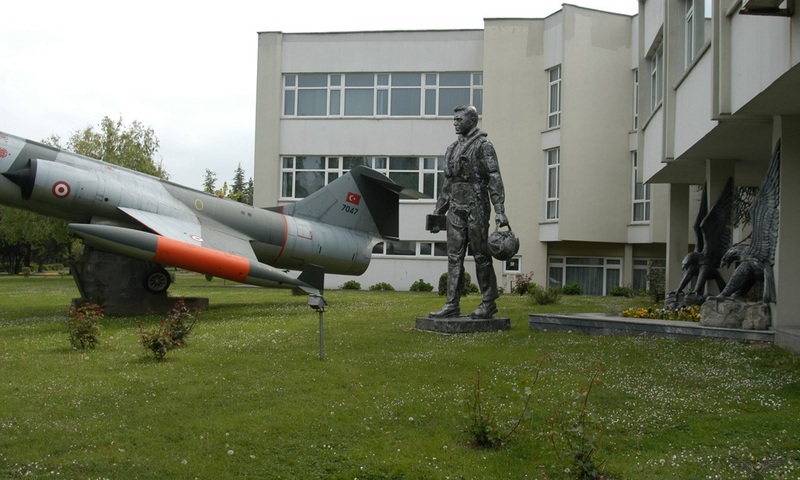 F-104G (c/n 7161) “65-7161”, Turkish Air Force, preserved at the Isiklar Askeri Lisesi (Military High School) at Bursa (Sivirhisar AB) wearing F-16 camouflage scheme, together with F-104G “2239”. 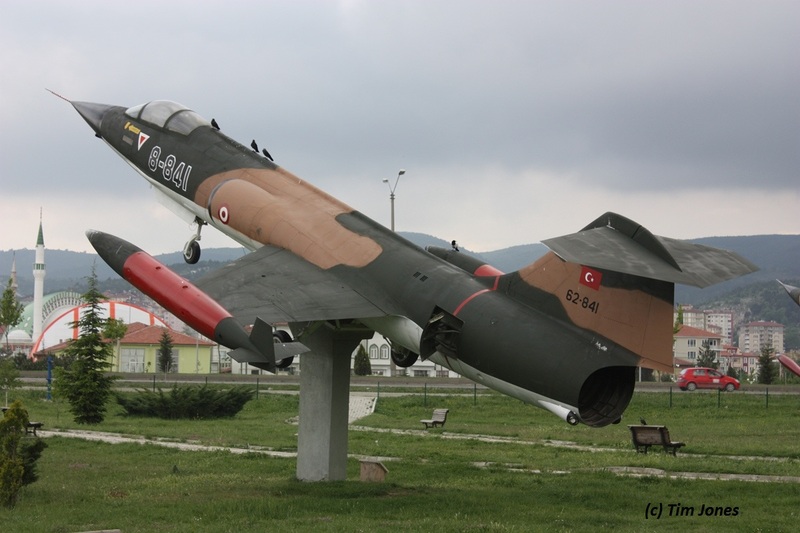 F-104G (c/n 7164) 7164 “9-164” of 9AJU, Turkish Air Force, preserved as gateguard with German MFG1 badges at Akhisar AB. 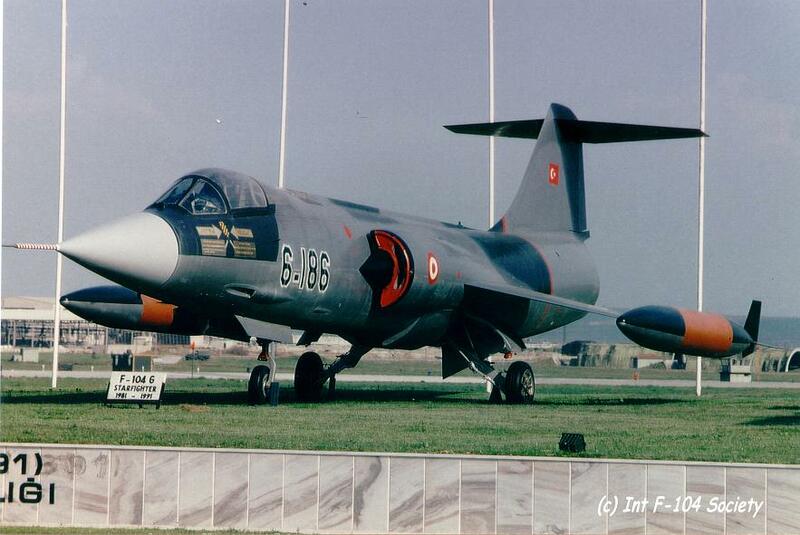 F-104G (c/n 7185) 7185 “6-185” of 6AJU, Turkish Air Force, preserved at Eskisehir AB. F-104G (c/n 7186) formerly as “6-186” but nowadays as “6-1046”, Turkish Air Force, preserved at Bandirma at the display area. 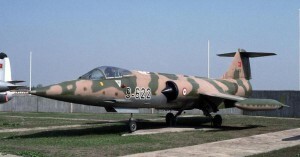 Photo shows the aircraft still before it was repainted in Green-Brown camouflage scheme. 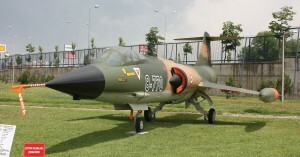 F-104G (c/n 7190) 7190 “8-190” of 8AJU, Turkish Air Force, preserved inside the University Aviation Park at Anadolu. 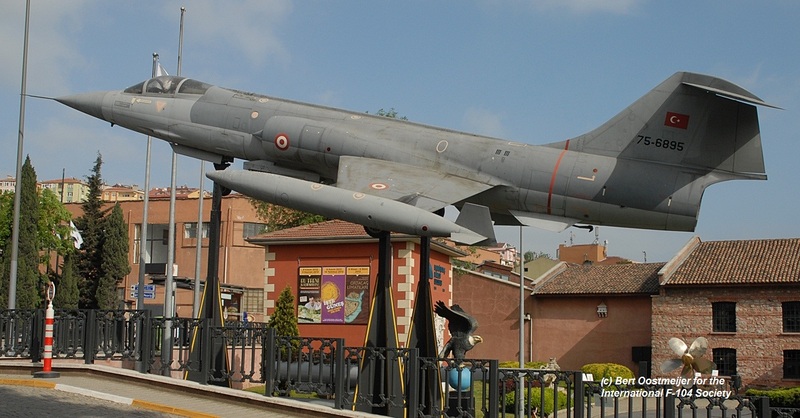 (Formerly known as Eskisehir Air museum). 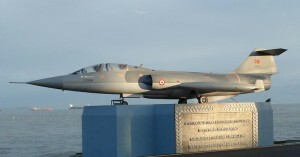 In between it has been repainted in 2007. 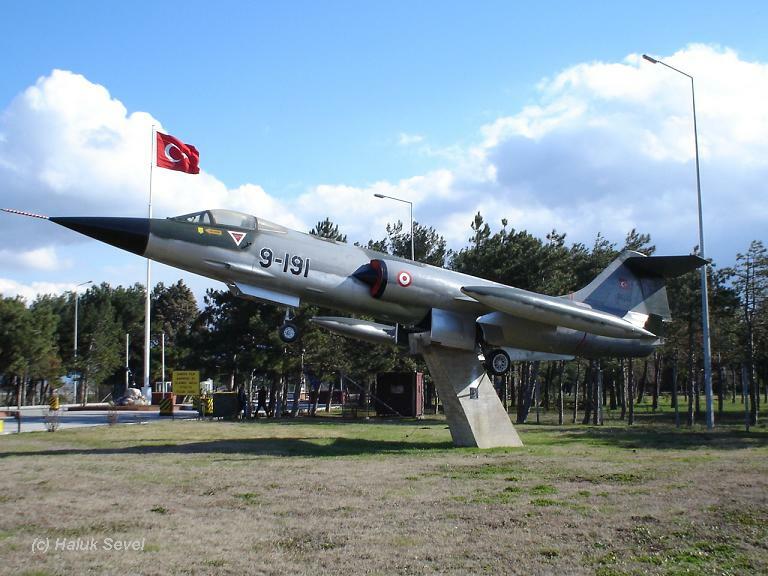 F-104G (c/n 7209) 7209 as “209”, Turkish Air Force, preserved at Yalova since around 2003 and moved to the entrance lane of the airfield in 2008. 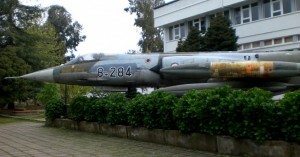 F-104G (c/n 7304) 7304 as “8-304”, Turkish Air Force, preserved at the 6AJU premises at Bandirma AB. Former preserved at a children playground at coastal town Zonguldak but removed due to vandalism. 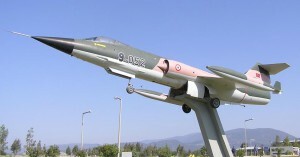 F-104G (c/n 8060) “9-2000” , Turkish Air Force, preserved at the entrance of military side Dalaman – Marmaris Airport, on a pole. 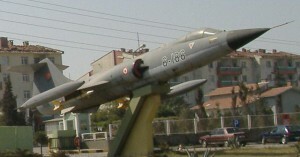 F-104G (c/n 8090) 8090 “9-191” (representing 191 Filo) of 9AJU, Turkish Air Force, preserved on a pole at Balikesir AB near the 191 filo premises. 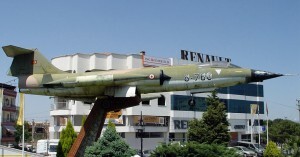 F-104G (c/n 8105) 8105 “4-105” of 4AJU, Turkish Air Force, preserved at the premises of the University Campus in Ankara. 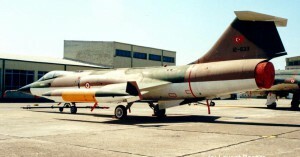 In between the aircraft has been sprayed into a white colorscheme. 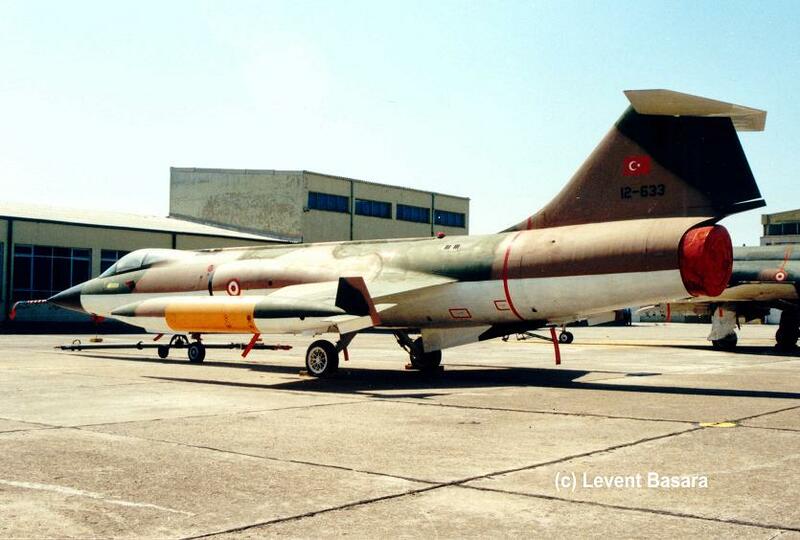 F-104G (c/n 8128) 8128 “8-128” of 8AJU, Turkish Air Force, preserved at Diyarbakir AB (possibly removed and scrapped?). 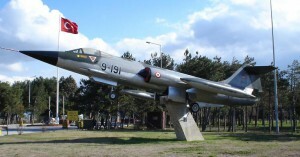 F-104G (c/n 8168) 8168 “8-168” of 8AJU, Turkish Air Force, preserved on a lawn at the Arslanbey Campus in Kocaeli. 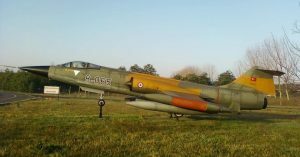 F-104G (c/n 8205) 8205 “8-205” of 8AJU, Turkish Air Force, preserved on a pole with wheels in as collection of the Air Museum in Etimesgut. 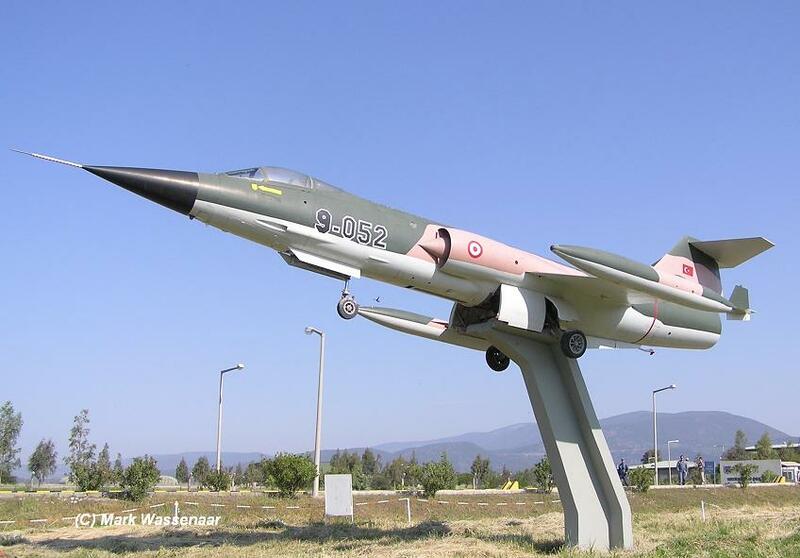 F-104G (c/n 8277) 8277 currently on display on a pedestal at 141 Filo operations area at Akinci AB found in the South of the complex, since 2012 as “4-277” . 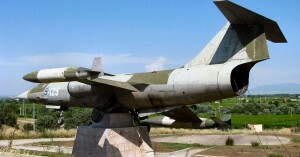 Repainted in 2015. 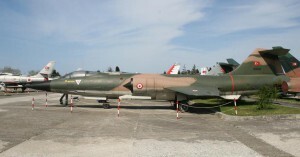 F-104G (c/n 8284) 8284 “8-284” of 8AJU, Turkish Air Force, preserved at the premises of the Karadeniz Technical University at Trabzon. 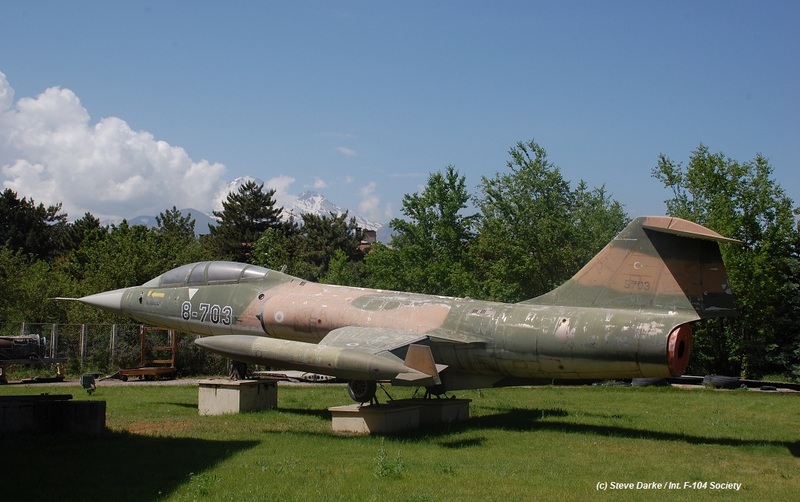 F-104G (c/n 8286) 8286 “9-286” of 9AJU, Turkish Air Force, preserved at the premises of the University Campus in Erzurum. 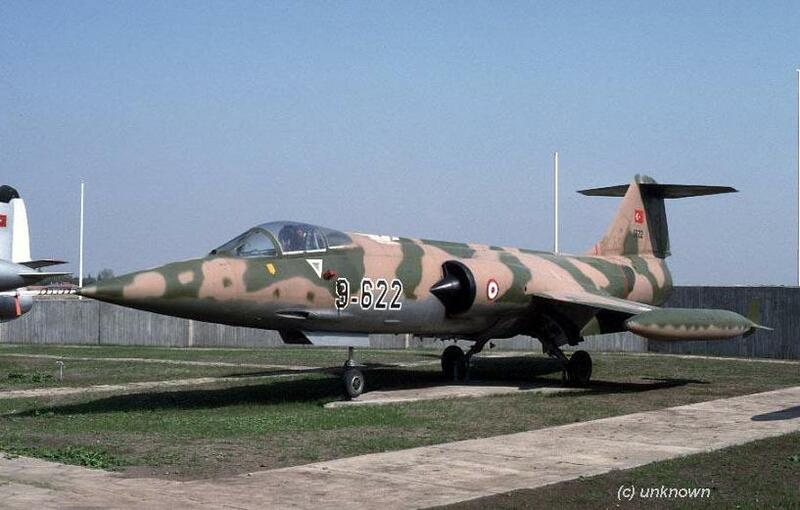 F-104G (c/n 8299) 8299 as “8288/8-288” of 8AJU, Turkish Air Force, (formerly preserved inside the Sports Complex at Yesilyurt. 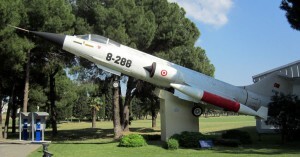 After refurbishment into a white color scheme it was put on display at Izmir AB Cigli as “8-288” North of the gate near the officers mess/barracks. 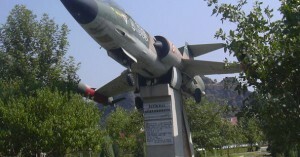 (Photo was taken in June 2011). 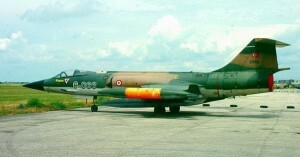 F-104G (c/n 8321) 8321 “8-321” of 8AJU, Turkish Air Force, preserved as gateguard at Batman. 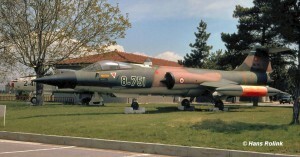 F-104G (c/n 8346) 8346 “8-346” of 8AJU, Turkish Air Force, preserved at the Marmara University at Goztepe City. 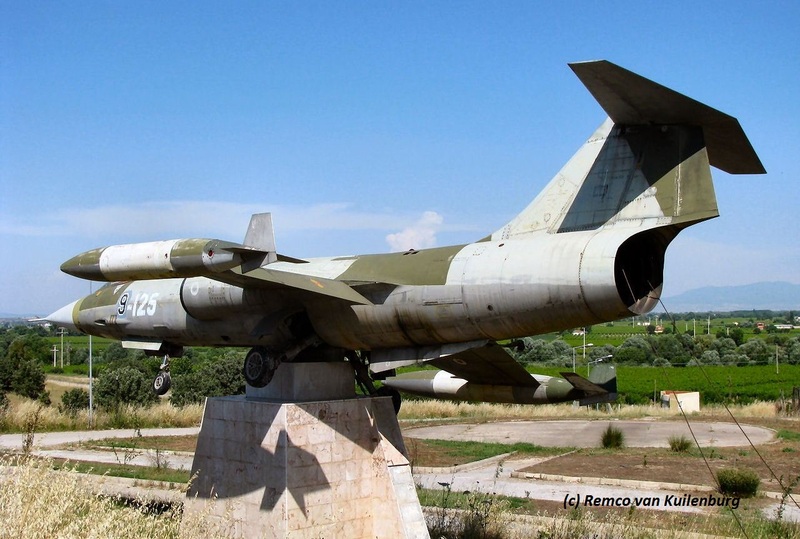 F-104G (c/n 8347) 8347 as “65-8347” , Turkish Air Force, preserved near a military hospital at Incirali near Izmir. 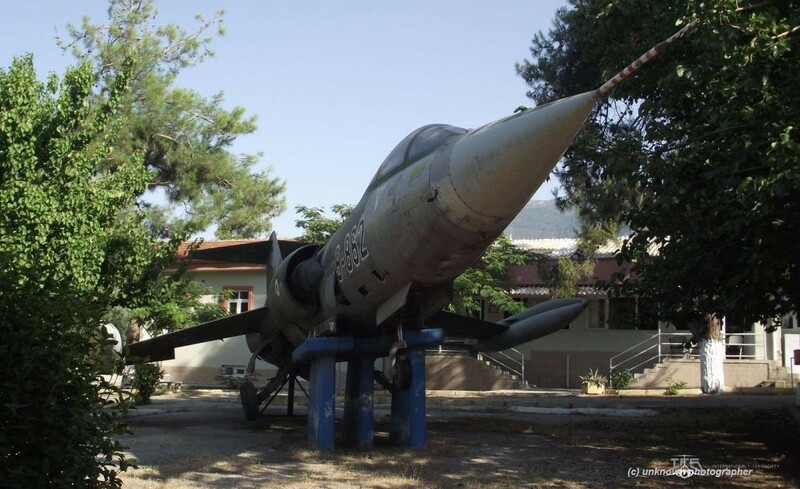 F-104G (c/n 9052), Turkish Air Force, preserved at Bodrum. 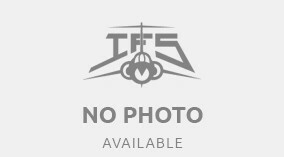 It was seen in the past as “4-852″ but currently it is coded 9052/”9-052”. 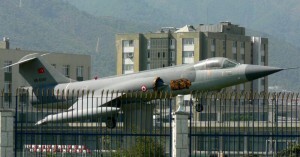 (We still need some extra confirmation about its identity). 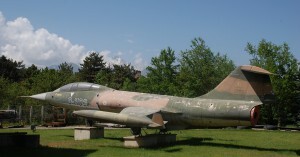 F-104G (c/n 9078) 9078 “078”, Turkish Air Force, preserved at the Turkish Military School at Yesilyurt-Okulu. 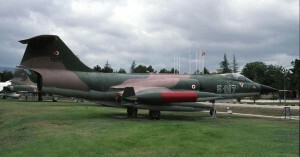 F-104G (c/n 9083) 9083 “083”, Turkish Air Force, preserved at the Turkish Military School at Yesilyurt-Okulu. 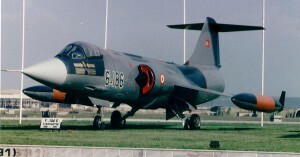 F-104G (c/n 9135) 9135 “8-135” of 8 AJU, Turkish Air Force, preserved as gateguard at Erzurum. 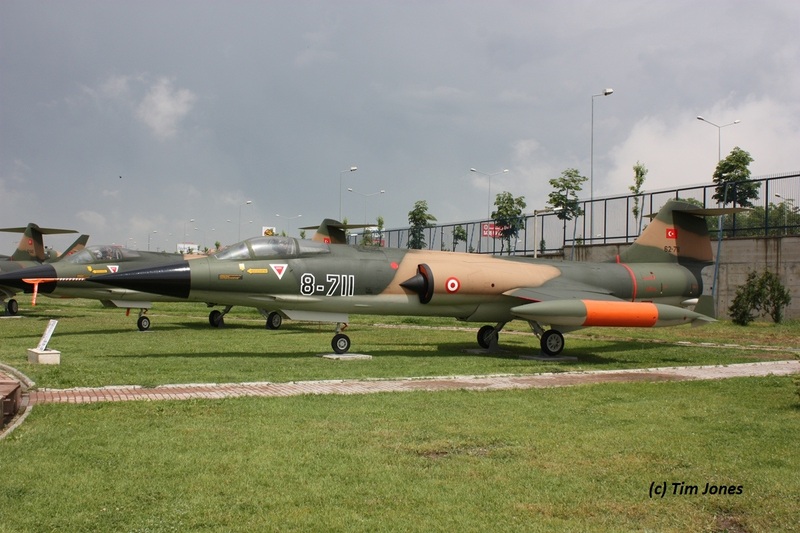 F-104G (c/n 9145) 9145 in 4 AJU special paintbrush colorscheme, Turkish Air Force, preserved at Balikesir Air Base near 192 Filo buildings. 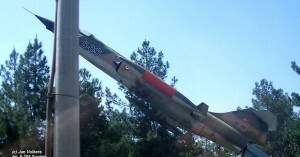 Until 2006 it had a special color scheme which was paintbrushed over in 2006. 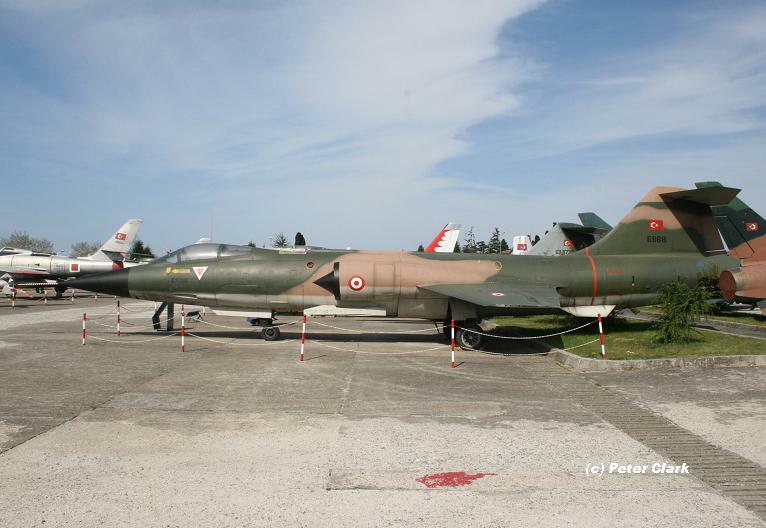 CF-104D (c/n 5312) 104642 “8-642” of 8 AJU, Turkish Air Force, preserved inside the Air Museum collection in Etimesgut. 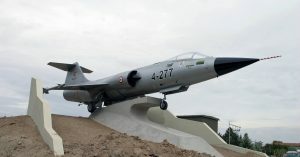 CF-104 (c/n 1011) 104711 “8-711” of 8 AJU, Turkish Air Force, preserved at the Air Museum in Etimesgut. 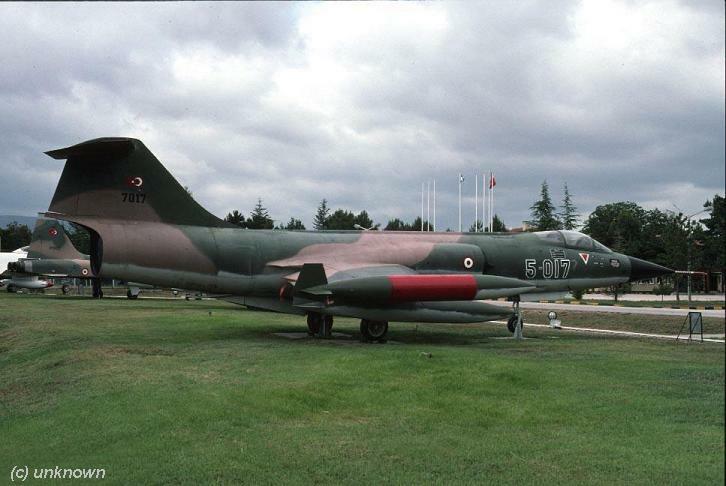 CF-104 (c/n 1013) 104713 “8-713” of 8 AJU, Turkish Air Force, preserved at Diyarbakir AB on the preserved aircraft area. 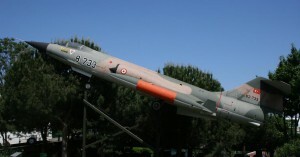 (“62-713”). 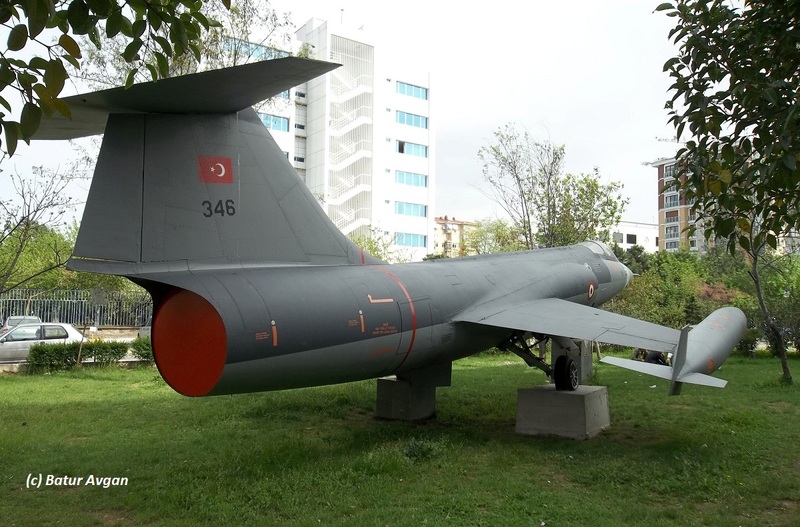 CF-104 (c/n 1033) 104733 “8-733” of 8 AJU, Turkish Air Force, preserved inside the Askeri Muzesi collection in Istanbul-Harbiye. 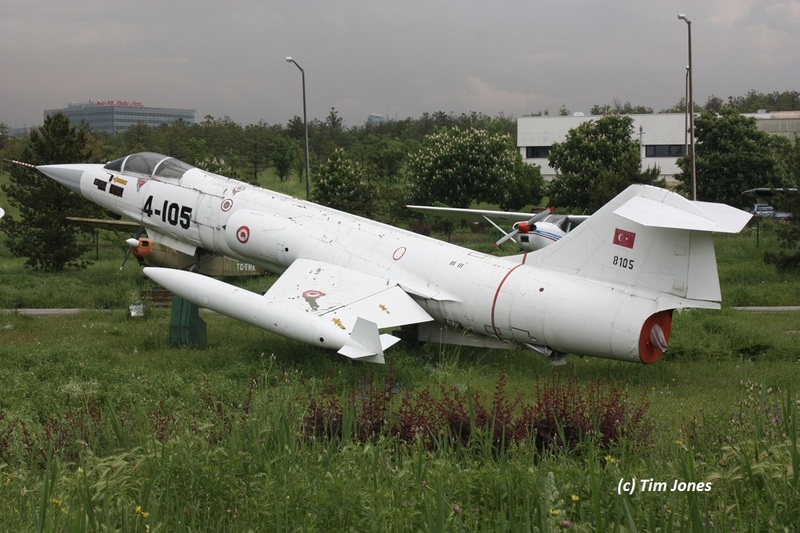 CF-104 (c/n 1051) 104751 “8-751” of 8 AJU, Turkish Air Force, preserved near the Aerospace factory entrance at Eskisehir. 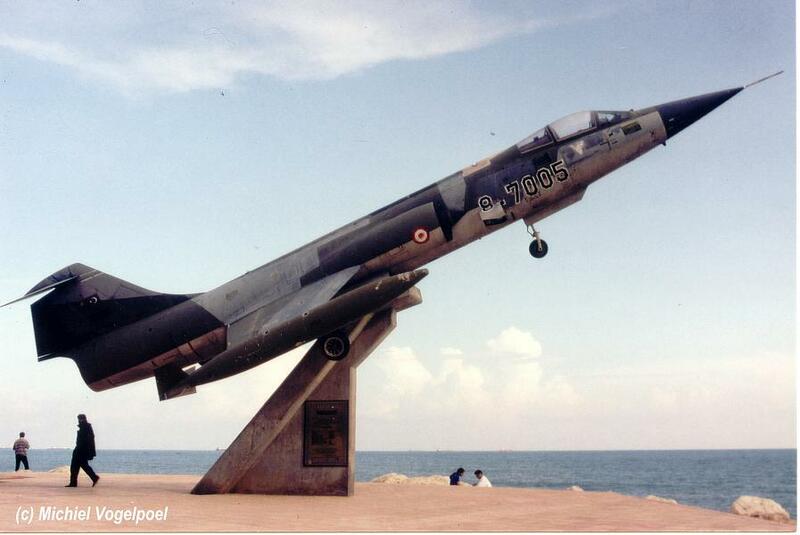 CF-104 (c/n 1056) 104756 “8-756” of 8 AJU, Turkish Air Force, preserved Cayagzi, at the entrance of a large complex along the coast, West of Riva city. 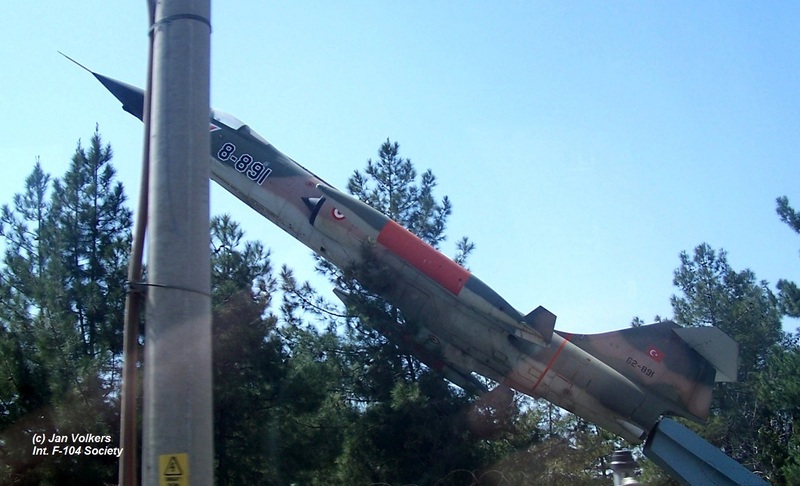 It has been there already at least since mid 2011. 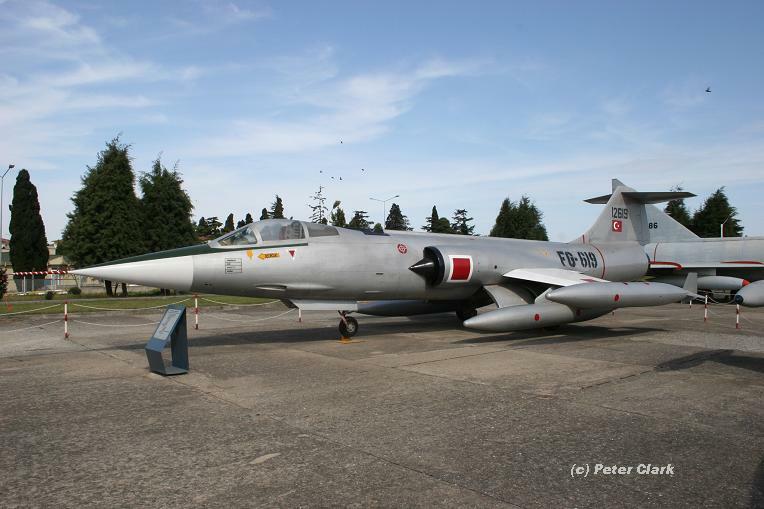 CF-104 (c/n 1070) 104770 “8-770” of 8 AJU, Turkish Air Force, preserved inside the Air Museum collection at Etimesgut. 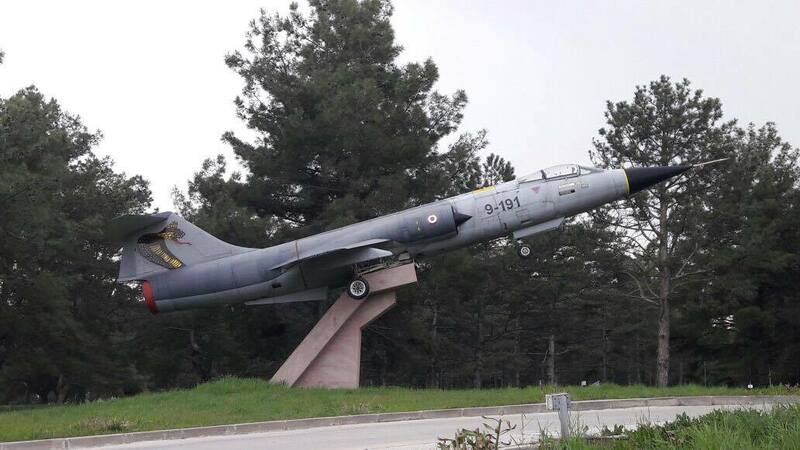 CF-104 (c/n 1086) 104786 “8-786” of 8 AJU, Turkish Air Force, preserved as “62-786” on a pole in the mountains at Sevgi Mh. 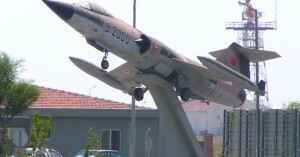 South of Gaziemir/Izmir. 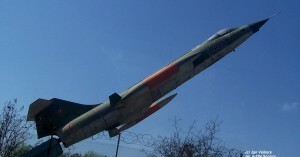 In earlier years before 2008 it was preserved on a pole near the harbor. 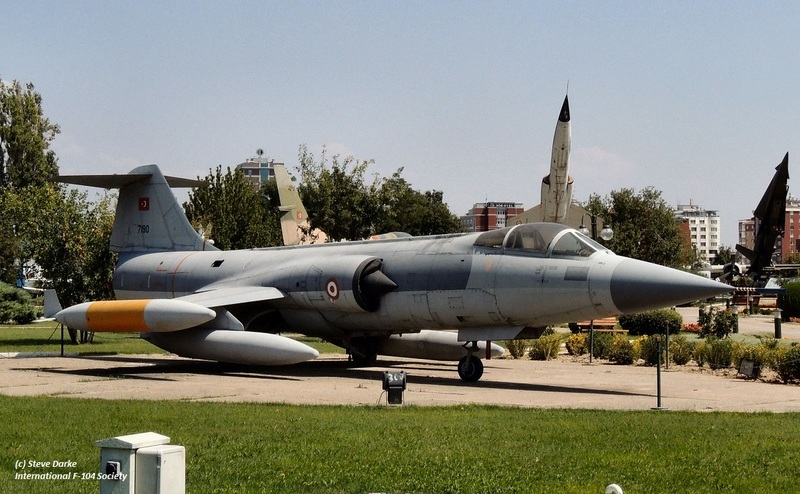 CF-104 (c/n 1108) 104808 “8-808” of 8 AJU, Turkish Air Force, preserved as gateguard (“62-808”) at Diyarbakir AB. 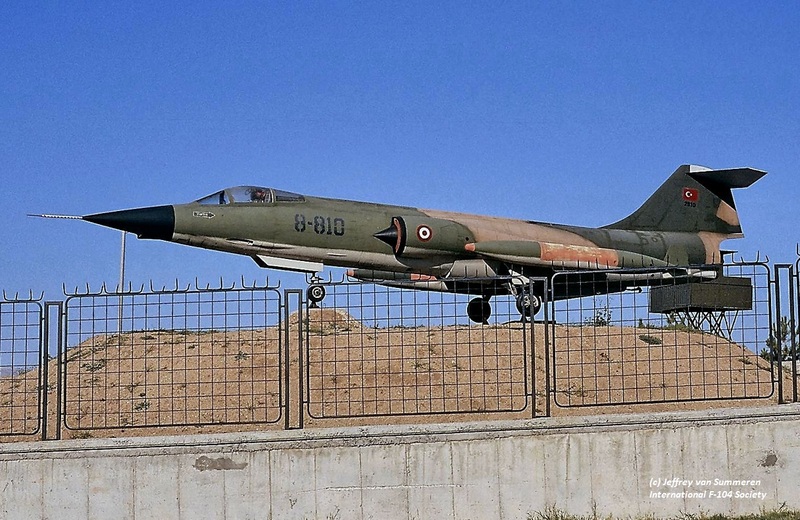 CF-104 (c/n 1110) 104810 “8-810” of 8 AJU, Turkish Air Force, preserved on a sand dune near 3rd AMSC barracks at Etimesgut. 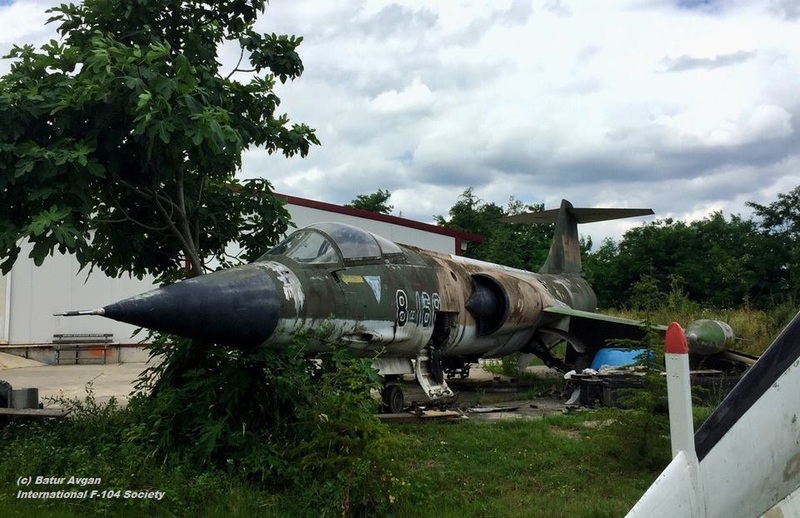 Since early May 2008 it disappeared… probably being repainted because in May 2015 it was seen preserved again. 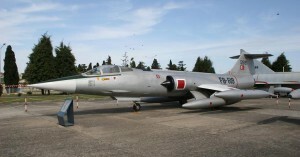 Photo shows the aircraft some years ago. 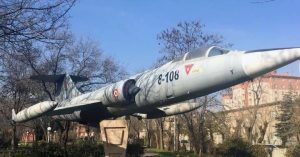 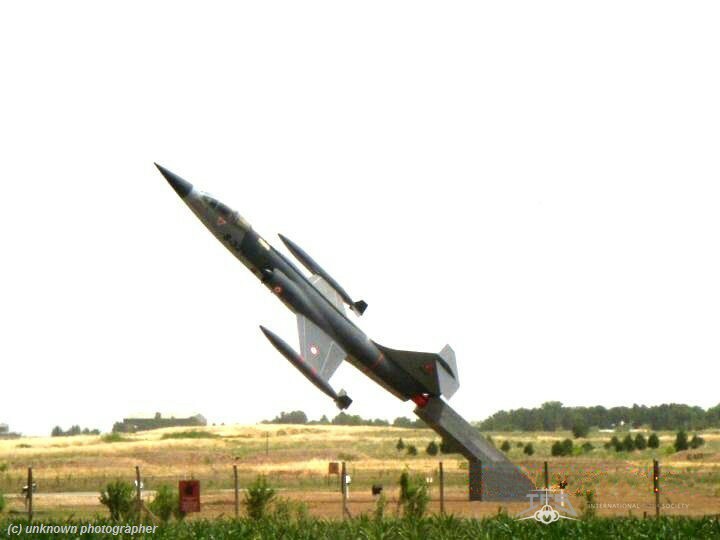 CF-104 (c/n 1141) 104841 “8-841” of 8 AJU, Turkish Air Force, preserved on a pole inside the Kütahya Park, north of Diyarbakir AB. 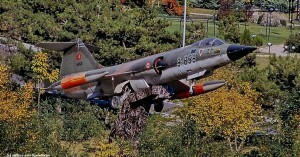 CF-104 (c/n 1169) 104869 “8-869” of 8 AJU, Turkish Air Force, preserved at Ordu, wearing an F-16 grey color scheme and designation “63-869” on its tail. 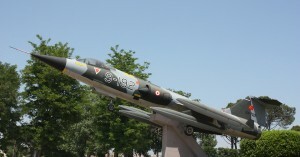 CF-104 (c/n 1137) 104837, 8-873, preserved at Kayseri. 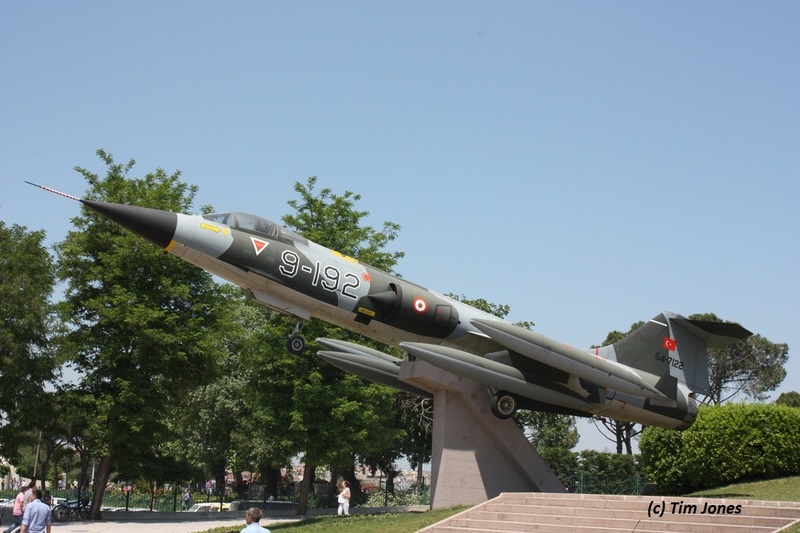 CF-104 (c/n 1191) 104891 “8-891” of 8 AJU, Turkish Air Force, preserved at the gate of Diyarbakir AFB. 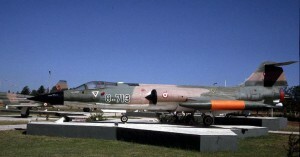 CF-104 (c/n 1???) 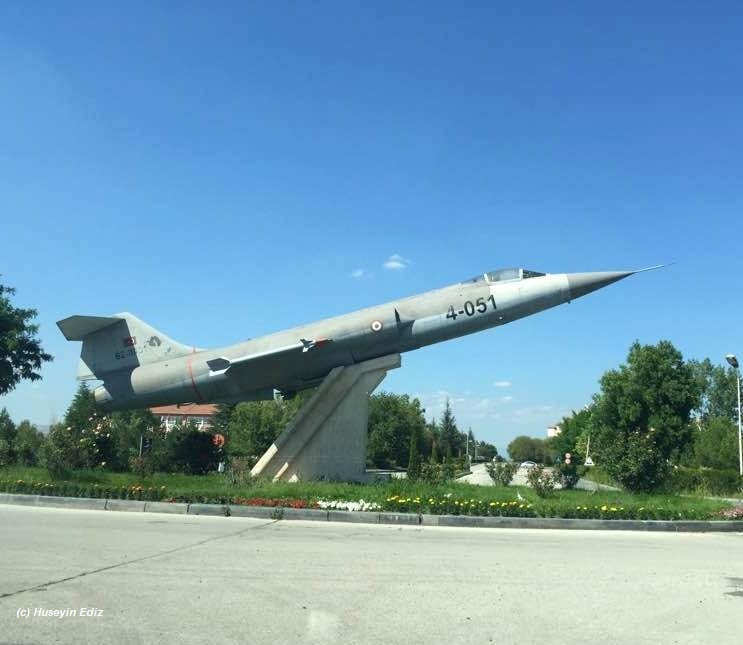 104??? 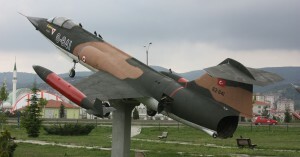 “4-955” of 4 AJU, Turkish Air Force, preserved on a pole in Osmancik Corum. 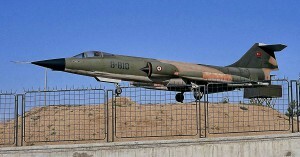 F-104S (c/n 1???) 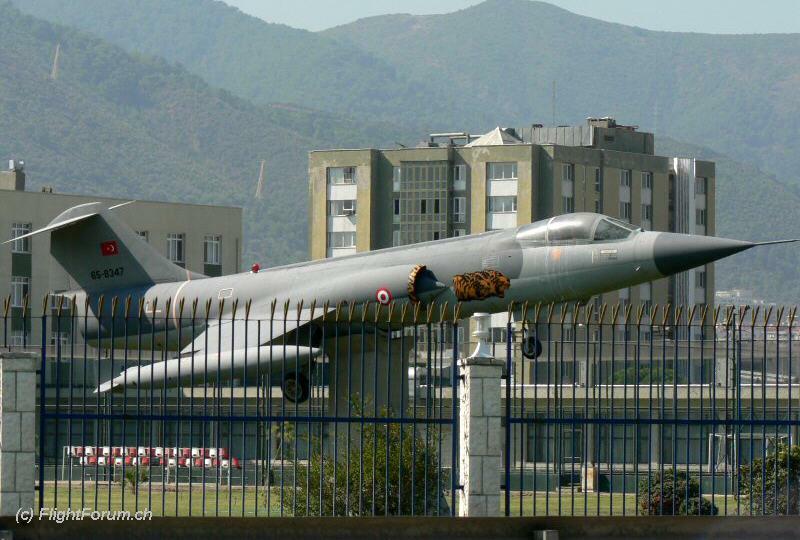 as fake “6-186” of 6AJU, Turkish Air Force, preserved at Bandirma AB gate. 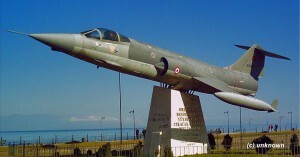 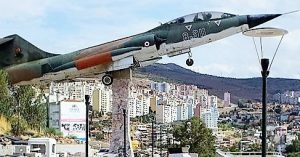 An unknown CF-104 Starfighter can be found preserved on a pedestal at the village of Trabzon, near the coast, since 2018. 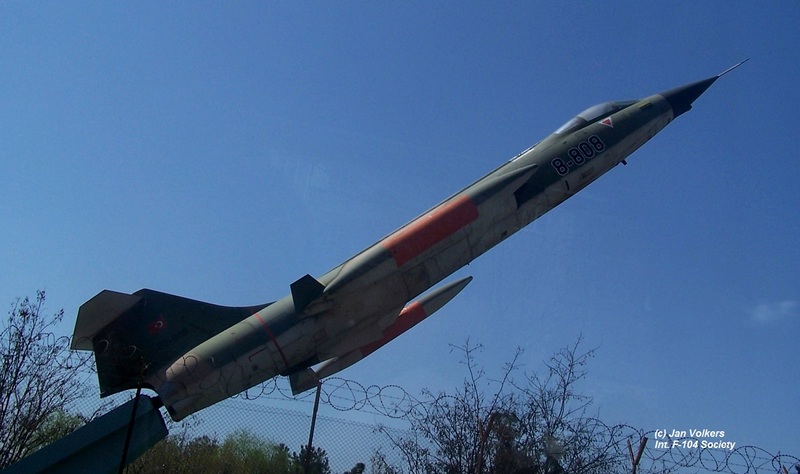 It wears fake serial “78-135”. 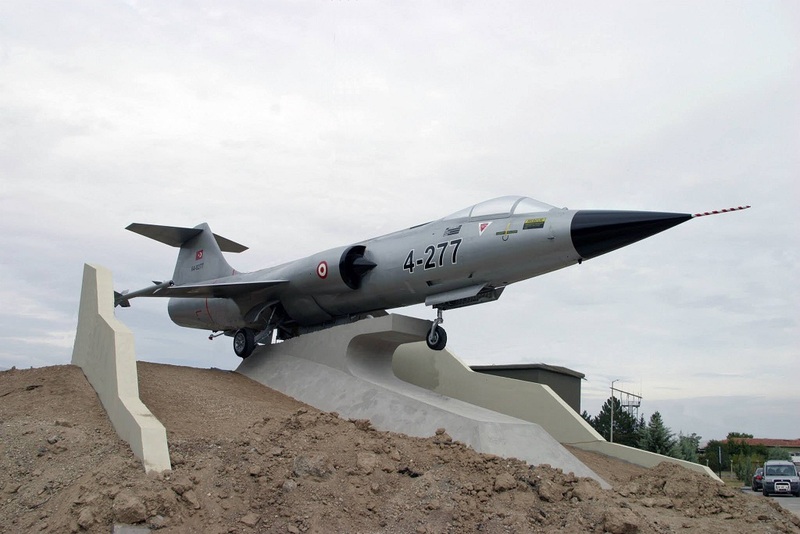 An unknown Turkish Starfighter can be found preserved at Mus, 115 km South of Erzurum. 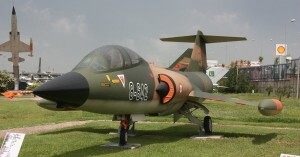 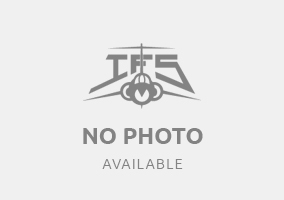 F-104G (c/n ????) 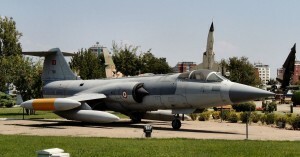 “260” , Turkish Air Force, preserved at Akinci (formerly known Murted AB) completely bare metal and still unidentified. 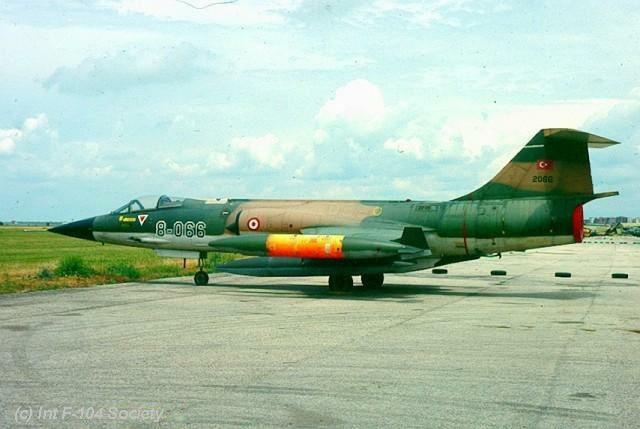 Who knows more about its identity? 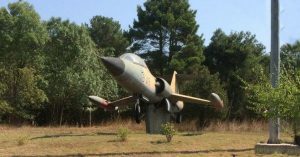 It can be found in the middle of the airbase not visible from outside. 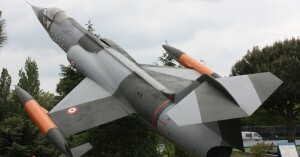 It looks like it has been refurbished a bit recently having received red tiptank tips and vulcan mouth. 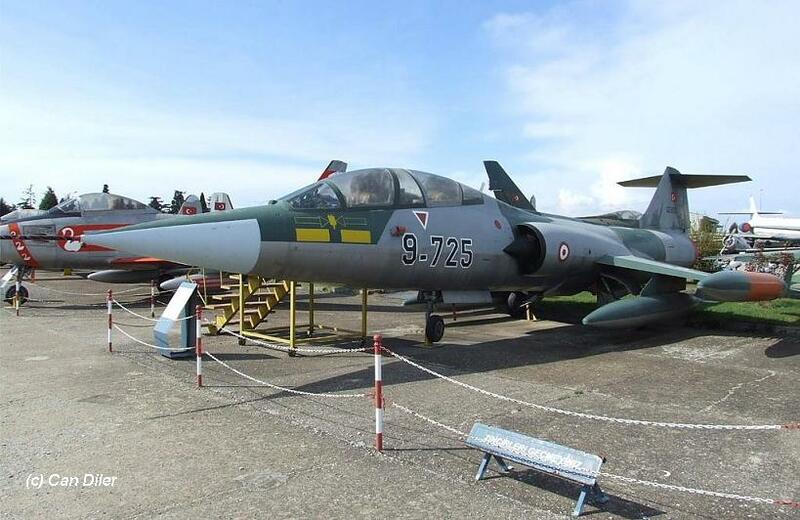 Also it looks like a small serial “4-260” has been applied on the fuselage (seen in 2013). 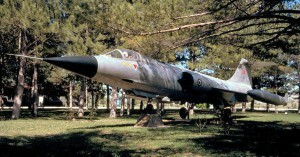 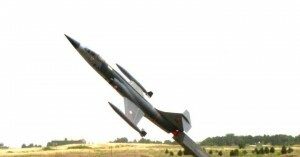 CF-104 (c/n ????) with fake code “2733 code 4-733” , Turkish Air Force, preserved near Hendek town, on a hill along the road. 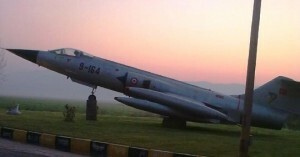 Identity is still unknown. 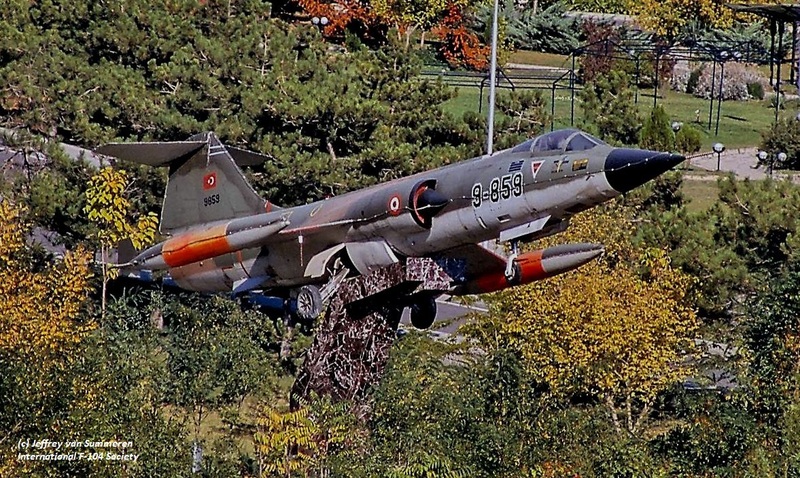 It really looks like a CF-104 since it is missing its navigation light on top.